Despite what you’ve heard on the news, the San Diego real estate market isn’t crashing. The sky is not falling. It is, however, a market in transition beyond the usual seasonal slowdown. It’s not the bubble bursting; there’s no need to panic. But all signs point to a normalization of the real estate scene compared to the last few years, and especially the crazy environment of this past spring. As I am writing, we are looking at an absorption rate of 2.8 percent. Effectively, a little over 2.5 months of inventory. A ‘normal’ real estate market requires there to be a 6-month supply of homes for sale in order for prices to increase only with inflation. The fact is, there are a number of other major markets around the country that have transitioned from a seller’s market to a heavy buyer’s market for numerous reasons including the foreign investment market. Our situation is a bit different. Because San Diego is home to military, major employers and our job growth is still booming. While the bubble isn’t bursting here, we are shifting to more of a neutral market. A record number of homes entered the market in June, July, and August the most since the crash in 2008. So, there is a lot more inventory available to buyers. Some neighborhoods have plateaued in terms of price — home prices can only rise so high before buyers just won’t or can’t buy. • Prices will be negotiated down, not up, because of the time on the market. While we saw a record number of homes come on the market, we also saw a record number of price reductions. If you’re considering selling your home, or are already on the market, you’ve got to recalibrate your expectations. Especially in terms of pricing strategy: sellers are typically behind the market by several months. Price right for the market now. Last spring, a seller wouldn’t have had to accept a normal offer, with any negotiation and/or contingencies. 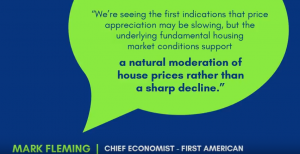 But with more inventory and the mortgage interest rates on the rise and now over three-quarters of a percentage point higher than they were at the beginning of the year this impacts buyers purchasing power and expectations. For sellers, in shifts like this that call for an experienced, seasoned agent who looks at the data and knows what it means. This is the time when the top agents shine. They can negotiate the highest and best offers when selling, getting all contingencies satisfied or changed, and get the deal all the way through to the settlement table. Buyers need a seasoned agent to get them the best price. But don’t expect huge deals, the market hasn’t shifted that much. You’ll be able to buy at market rate, and in most cases not get into a bidding war. And your contingencies are more likely to be accepted, protecting your interests as much as the sellers. But, again, you need an experienced agent who can read the markets and advise you appropriately. The San Diego market isn’t crashing. Don’t panic. The market is shifting, but back toward normal. Get the right advice, and you’ll succeed regardless of whether it’s a buyer, seller, or neutral market.